BOHEMIA QUEEN LACE HAND CUT 24% LEAD CRYSTAL 18k GOLD AND ENAMEL PLATED FROM CZECH REPUBLIC. HEIGHT 6", DIAMETER 3", VOLUME 350 ML APP. 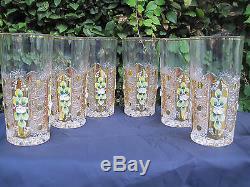 THIS IS OF FINEST CZECH REPUBLIC, BOHEMIA, 24% LEAD HAND CUT CRYSTAL ITEMS. We have been in crystal business over 26 years based in Southern California. Your satisfaction with every item is 100% guaranteed. The item "BOHEMIA QUEEN LACE HAND CUT 18K GOLD ENAMEL 24% LEAD CRYSTAL WATER GLASS 12 OZ" is in sale since Saturday, January 28, 2017. This item is in the category "Pottery & Glass\Glass\Art Glass\Bohemian/Czech\Other Bohemian/Czech Art Glass".